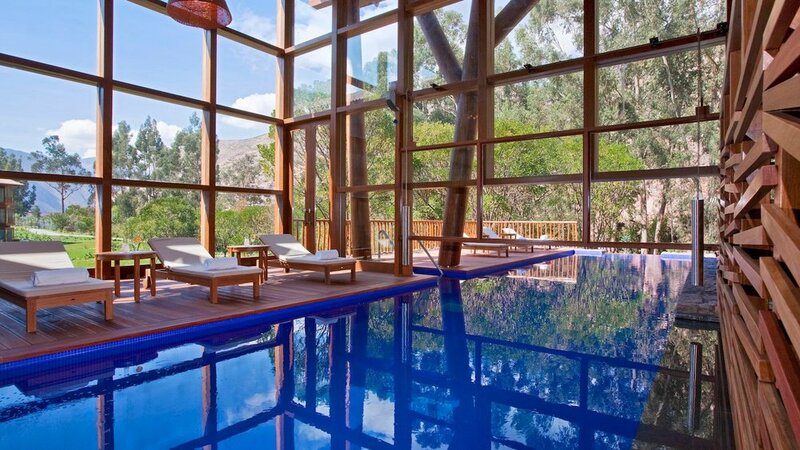 Tambo del Inka is the ideal place to stay if you are visiting the Sacred Valley and want to feel pampered after a day of exploring the 15th century ruins of Machu Picchu. The lobby (pictured in header, above) features soaring ceilings and colorful native artwork. We (and a few other weary travelers) arrived before check-in time and had to wait for our rooms to be ready. The bright, airy space was a nice place to relax while we waited for our room keys to be ready. There is coco tea in the lobby to help with nausea. Click here to learn more about Machu Picchu luxury tour options with Abercrombie & Kent and Adventures by Disney. After checking in and before our room was ready, we killed time at the Kiwi bar near the lobby, which serves cocktails and snacks. It’s gorgeous! We had the most amazing dinner at Hawa, the hotel’s formal dining option. It was like eating at any other five star restaurant in the world, except that there were interesting options like “guinea pig” on the menu. Also - lots of quinoa! The resort grounds are sprawling and immaculate. 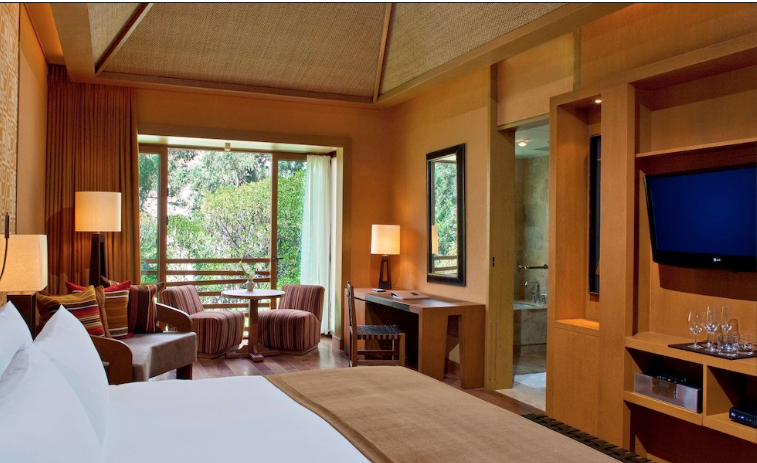 Rooms are spacious, spotless, and beautifully decorated. The hotel room decor complimented the Peruvian surroundings, and I appreciated the pieces of native artwork throughout the property (including some gorgeous pieces in our room). We got spa treatments the day after the hiking Machu Picchu because we had nothing else to do, and the hotel is made for relaxing! I didn’t take photos of the spa & pool area (again - pre-travel agent/blogging days! cut me some slack!) so these are also from the website. One more reason the hotel is the perfect base for exploring Machu Picchu: it has its own private train station that goes directly to Machu Picchu and back. And — the hotel makes boxed lunches that you can take with you in the morning and will deliver them to your room before you leave to go hiking. Genius! Funnily enough, the train schedule didn’t work with our time schedule, so we ended up catching the regular Peru Rail in the morning and taking the hotel’s train back at the end of the day. Look at this gorgeous alpaca! Llamas are all the rage now but alpacas are a little cuter, if you ask me! The clouds and mountains and flora - it actually reminded me a lot of home. Nov 12 All Hotel Ratings and Reviews.